Are you looking for the latest marketing trends? Wondering how the wide choice of devices and platforms are impacting marketers and consumers? 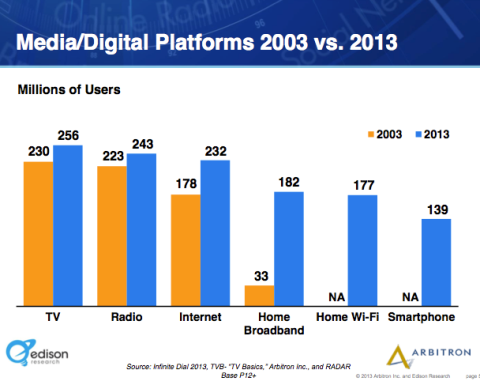 According to the 2013 Infinite Dial Report by Edison Research, media usage is not a zero-sum game. Consumers want to use all channels simultaneously, and as a marketer, you have to keep up by tracking them down wherever they go. To do that, you’ll need to understand these 6 emerging trends that will have a significant impact on your marketing strategies. Consumers are everywhere, all at the same time. According to the Edison report, there are 256 million U.S. users on TV, 243 million on radio, 232 million on the Internet, 182 million connected at home via broadband, 177 million connected at home via wi-fi, and 139 million smartphone users. Media multitasking is the new normal. Your goal as a marketer should be to distribute content across as many types of media and platforms as your budget can allow. Make fast, confident decisions that give digital consumers opportunities to buy. Keep in mind that capturing your customers’ attention will become harder as media multitasking becomes the new normal. Your digital content will need to be smarter, more creative and more visual to connect and engage today’s audiences. 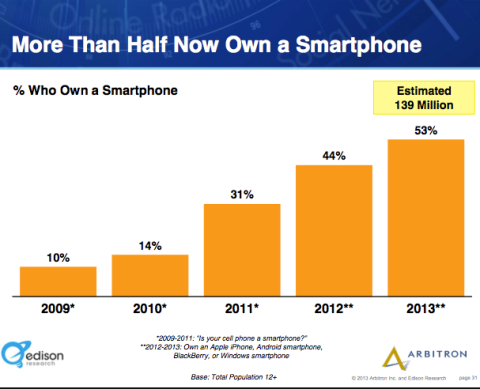 With 139 million (53%) of Americans owning smartphones, mobile use has reached critical mass in the United States. Research by eMarketer shows the amount of time people spend on a mobile device is growing at 14 times the rate of desktop usage. The same research indicates that mobile is becoming a more prominent channel for commercial transactions. In the second quarter of 2012, mobile sales accounted for 15.1% of total B2C retail ecommerce sales, compared to only 1.9% for social ecommerce sales. Smartphone usage has reached critical mass presenting unparalleled opportunities for digital marketers. What this means for marketers is that a mobile-first strategy is the new priority. The significance of location-based marketing, which has been around for a couple of years, will only continue to grow in importance. Finally, with a growing number of users downloading apps on their smartphones, a focused app strategy will help ensure that your brand remains forceful and relevant. Post social media content that is easy to consume and interact with on the go; for example, more images, brief posts, easy-to-execute calls to action. There’s no argument that content is still king. A 2012 survey conducted by Outbrain and research firm eConsultancy showed that 91% of in-house marketers use content marketing to sell their products and services. Additionally, 90% of all digital marketing professionals believe content marketing will become even more important over the next 12 months. 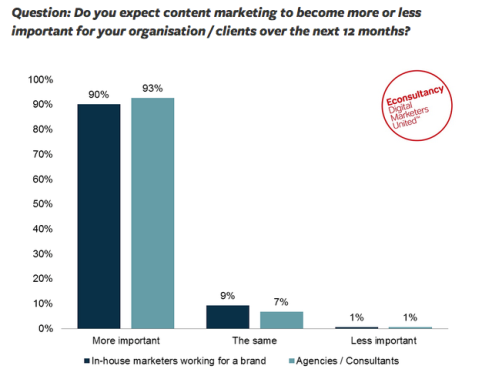 Digital marketers believe content marketing will become more important than ever. The same research pointed to the top 3 types of content that are working best for marketers: social posts and updates (83%), email newsletters (78%) and news or feature articles (67%). Focus on content marketing rather than advertising because consumers interact with content first, giving brands ideas or insights about what is important to them. Brands can then use these insights to craft their ads. Despite all of the changes that continue to take place on Facebook such as Graph Search and hashtags, the number of users on Facebook is rising, giving marketers opportunities to interact with audiences in innovative ways. Despite constant changes to the platform, Facebook remains top dog among social networks. Brands that use hashtags in their posts may have slightly higher reach than brands that don’t use them, according to Edgerank Checker. Hashtags will also open up new advertising opportunities for marketers, including the ability to advertise directly to users who have used or clicked on a particular hashtag. On the other hand, Graph Search is a valuable tool for helping you find people who like your Page. If you’re a local business this means you can create content, ads or free giveaways just for fans in your geographical location, thus encouraging a more vibrant local community. To stay ahead of the game, marketers must learn and master the Facebook environment in spite of unexpected and often frustrating changes to the platform. 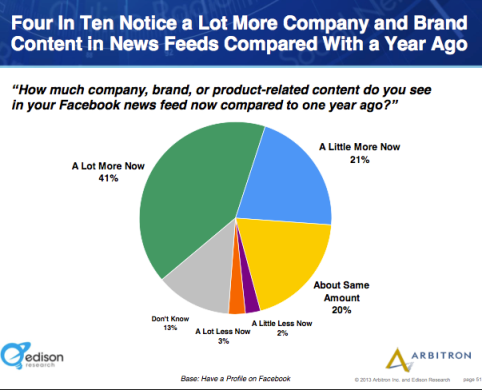 A majority of Facebook users (62%) noticed more branded content on their news feed. Most users don’t visit a brand’s Facebook Page. They interact with brands on their news feed, which is where opportunities and challenges lie for marketers. Branded content on users' news feeds presents significant opportunities and challenges for marketers. On the bright side, users who want to interact with brand content will be more engaged and open to brand messages. The opposite is true for users who just want to hang out with their friends. They’ll simply hide any brand content they don’t want to see (especially if those posts are frequent and intrusive). We know that photos already make up 50% of news feed stories, and that images will continue to grow in importance. To get consumers to interact with branded content on Facebook, marketers should make posts more visual and provide interesting yet relevant insights about your company. Invest in eye-catching, high-quality photos that will be pulled into users’ news feeds when they interact with your Page. 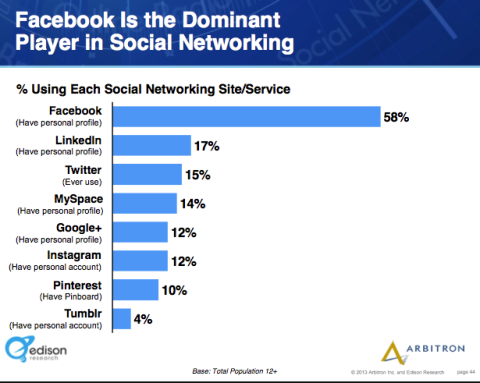 Although Facebook is at the top of the social media world, the Edison report shows that Twitter is getting more popular. 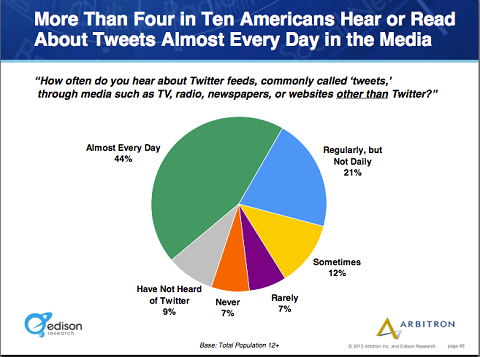 Notice that only 11% of Americans “Have not heard of Twitter,” which means 89% have! The hidden potential of Twitter is bigger than most people think. You might say, “But only 15% of Americans actually use Twitter!” (See Fig. 4). True. However 44% hear about tweets on other media “Almost Every Day” and 84% have seen or heard of tweets in other media at some point (green, plus blue, plus yellow, plus purple slices = 84%). This means that an overwhelming majority of Americans have been exposed to Twitter via multimedia consumption. This statistic justifies the conclusion that Twitter is a much bigger platform than most people give it credit for, and marketers should be the first to recognize its hidden potential. Take advantage of the current Twitter-friendly multimedia environment and promote your brand among non-Twitter audiences. Encourage them to talk about you online using tweets, and in particular, using your brand’s hashtag. The biggest takeaway from the Edison and eMarketer research is that audiences are dispersed across multiple channels and platforms. This presents its fair share of challenges for digital marketers as we try to keep up with omni-channel consumers. If you know how media fragmentation works and how to engage with consumers across multiple channels and devices, you’ll maximize value for your brand. What do you think? Which of these digital trends have you already experienced? How are you responding to them? Please leave your questions and comments in the box below.